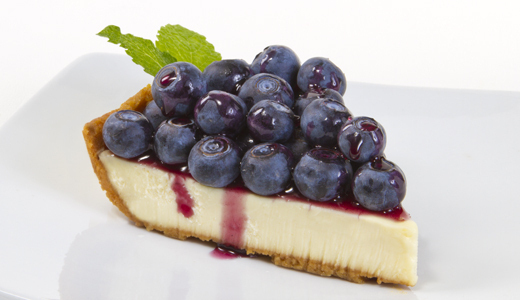 This month at Fresh From Florida, Florida Blueberries are what we are featuring this month. I have kind of been overboard with blueberries lately, but I just can’t help myself. I made this delicious jam the night I got home from picking 7 1/2 lbs. of them. It was a perfect day for picking them, it was threatening to rain so we had a nice cool breeze the entire time we were there. If you are planning to go pick some U-pick blueberries we were told because of this early heat we’ve been getting that blueberry season could be over quickly this year. Where we were picking they said 2 weeks compared to last year which went almost until the end of May. I know I plan to go again this week. One of the best things about living in Florida is the seasonal abundance of fresh fruits and vegetables. Look for the Fresh From Florida label when you are out shopping or at a local restaurant. With all of the choices we have it makes eating healthy so much fun. Eating fresh, seasonal items provides benefits such as products being fresher and tastier, the nutritional value is optimized, it encourages a diverse diet, is often more economical and harmonizes with nature’s production cycle. Did you know that 1 cup of blueberries have almost no fat, are packed with Vitamin C, are full of dietary fiber and contain Manganese? Research is also showing that eating blueberries will also help your memory. Who knew that this little berry was so good for you? When buying berries look for ones that are firm and smooth, that are a deep purple blue (red toned ones are not ripe), the containers are free of juice stains which means the berries could be bruised and a Fresh From Florida logo. I love making jams and jellies, there is nothing better on toast. The Grand Marnier I used in this jam gives the blueberries just a touch of citrus. If you don’t want to use alcohol in your jam I would use a teaspoon of orange zest and a 1/4 cup of fresh orange juice. Add it with the lemon juice in the recipe below. I made some blueberry buttermilk sweet biscuits the next morning for breakfast. So good especially with a spoonful of jam. These biscuits have a light glaze over them which adds just a little more sweetness. Did you know that Fresh From Florida has a website loaded with recipes? I love going there to see what they are featuring each month. 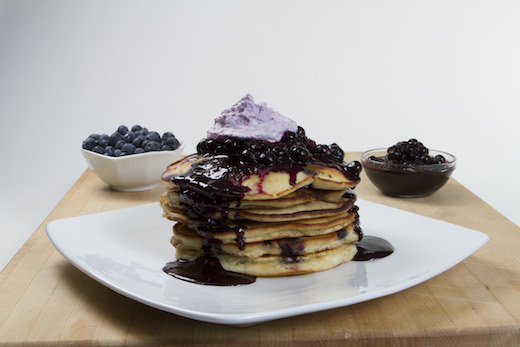 This month they are featuring Florida Blueberry Cheesecake and Blueberry Pancakes with a Florida Honey Butter. The honey butter was so good! Be sure to follow Fresh From Florida on Facebook and on Fresh From Florida on Twitter to see what new seasonal recipes they are sharing. Fresh picked blueberries with a hint of Grand Marnier made into a delicious jam. Wash your blueberries and then crush them. Measure them into the pan you are going to cook the jam in. Add the lemon juice. Gradually stir in the pectin.Bring to a full boil over high heat stirring constantly. Dump all of the sugar in, stirring until dissolved. When it comes back to a full rolling boil stir in the Grand Marnier. Boil for 1 minute. Remove from heat. Skim off foam if necessary. Take the jars out of the hot water one at a time. Ladle the hot jam into the jar leaving a 1/4 inch of headspace. Wipe the rim down with a clean, damp cloth. Then add the lid and the screw ring, tighten down to the point of resistance. Place each jar in the canner full of boiling water. Water should cover jars by 1 - 2 inches. Process for 10 minutes. Remove jars from canner and set on a clean towel. Make sure that the jars are sealed. If not, refrigerate immediately. Store jars in a cool dark place. « Giveaway for a All American Pressure Canner! wow, this sounds amazing, I sure wish I had one of those biscuits right now! pinned to try this soon, I love the Grand Marnier flavor! This sounds amazing!! I would love it if you link it up to Tipsy Tuesday at Grey is the New Black! I picked a lot of Blueberries this year and in the freezer. Ok to use Frozen?